While writing my saree stories I often ask myself what kind of a saree I prefer most? At times, like food, COMFORT is the word that pops out of my system. Yes indeed, it is not about range, fashion or brand, the real player is the comfort for a saree drape. 72/100 #100sareepact is dark -brownish maroon coloured south cotton, featuring a bright green border paired with golden zaree and orange thread work. The combination is an absolute punch of elegance and gaudy look with an ultimate touch of comfort. 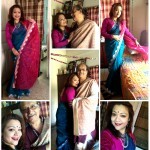 This is one of my favored sarees, gifted by my youngest sis, Tupur on her wedding day! The fall of December and wedding season setting in, thought of reliving a candid moment from past. As shared earlier I have never felt uncomfortable wearing saree and working rigorously. It was the wedding day; we all were busy, draped in our gifted attires. In a mid of some serious work, the lensman captured few naturals moments. 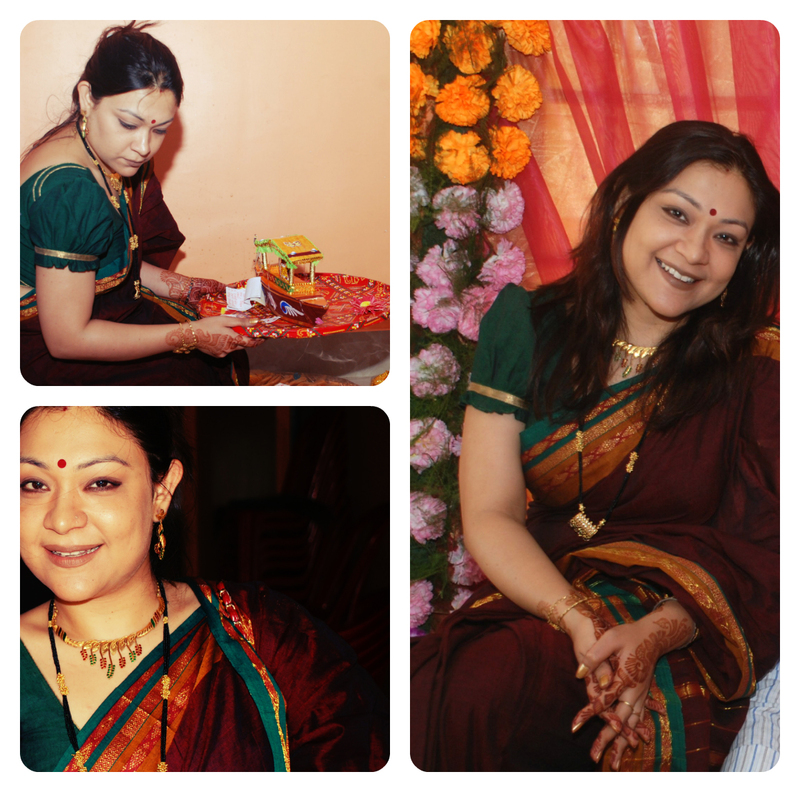 While creating today’s collage found these candid shots, and thought of coming up with this Comfort Saree story. The blouse was a designer make with a slight bulge near the shoulders to give that ‘ghorowa’ (homely) look of the Bongs. The beautiful jewellery set, the brown mehendi, golden nail paint all gelled and created the look of fun and festivity on that WoW Wedding environment! Thank God, cameras were discovered. A real feel-good & comfort story got revealed through my 72/100 comfort wear.